Although a lot of heat is generated over which .NET programming language is easier to use and learn, ultimately THE biggest learning curve is not C# or Visual Basic .NET—it’s the .NET Framework. This chapter takes you on a tour of some of the more interesting and useful classes and shows you how to use them in your applications. There are over 2,000 classes in the .NET Framework (compared to Visual FoxPro’s 35 base classes), making for a fairly steep learning curve when you are first learning about .NET. Many of the most important .NET classes are covered in detail in other chapters of this book. However, in this chapter, you will learn some details about classes that are also very important, but are not covered in detail elsewhere. This chapter will cover the classes by namespace so you also get a feel for the organization of classes in .NET, but it will not cover every namespace in the framework. First of all, there’s only so much I can cover in a chapter within the scope of this book, and secondly, a number of namespaces contain classes you will not normally use on a regular basis (for example the .NET classes you can use to write your own compiler). As mentioned in Chapter 1, “Introducing .NET”, before you can use a class in your code, first you need to make sure you reference its associated namespace (by means of the “using” directive in C# and the “Imports” directive in Visual Basic .NET). The System namespace contains quite a few classes that you use frequently and have already been introduced in previous chapters, such as the base value types—Boolean, Byte, Char, Decimal, Integer, and so on (Figure 1). The following sections shows a few other classes belonging to the System namespace that are also of interest. Figure 1. 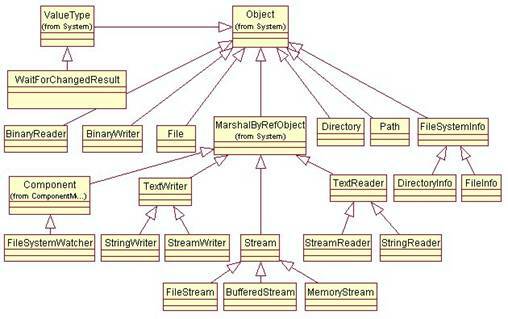 The System namespace contains many frequently used classes such as the base value type classes shown in this UML class diagram. The string alias in C# and the String alias in Visual Basic .NET are both shortcuts that refer to the System.String class. The String class provides a number of methods that allow you to parse strings. This is different than Visual FoxPro, which has a variety of independent functions you use to parse strings. The String class brings all of this functionality together in a single class. To determine the starting position of one or more characters within a string, you use the String class’s IndexOf method, which finds the first occurrence or the LastIndex method, which finds the last occurrence. You can also specify the starting character position and number of characters searched. "<GBAddress>Four score and seven years ago...</GBAddress>"
You can also determine if a string starts or ends with a specified string. To retrieve a substring of another string, you use the String class’s Substring method. You specify just a starting position or both a starting position and number of characters. You pad strings by using the String class’s PadLeft and PadRight methods. By default, these methods pad a string with spaces on the left or the right to make the string the total specified length. Alternately, you can pass a second character parameter that specifies a different pad character. In the following example, the PadLeft method is used to add five spaces to the left side of the Unpadded string. The PadRight method is then used to add five periods to the right of the string. // Returns " Once upon a time"
// Returns "Once upon a time ." Dim Unpadded As String = "Once upon a time"
' Returns " Once upon a time"
' Returns "Once upon a time ." Dim PadRight As String = MyString.PadRight((MyString.Length + 5)) + "." You trim characters from the beginning or end of a string (or from both) by using the String class’s TrimStart, TrimEnd, and Trim methods. If you don’t pass a parameter to these trim methods, they trim spaces from the string. Otherwise, you specify an array of one or more characters to be trimmed from the string. // Returns "I've been padded!!!!!" // Returns " I've been padded"
// Returns "I've been padded"
Dim MyPaddedStr As String = " I've been padded!!!!!" ' Returns "I've been padded!!!!!" ' Returns " I've been padded"
MyPaddedStr = " I've been padded "
' Returns "I've been padded"
You can insert, remove, and replace characters in a string or convert a string to uppercase or lowercase by using the corresponding Remove, Replace, Convert, ToUpper, and ToLower methods as shown in the following example. // Returns "<GBAddress>Four score and seven years ago our fathers...</GBAddress>"
// Returns "<GBAddress>Four score and seven years ago</GBAddress>"
// Returns "<GBAddress>Four score and seven years ago etc.</GBAddress>"
// Returns "<gbaddress>four score and seven years ago...</gbaddress>"
' Returns "<GBAddress>Four score and seven years ago our fathers...</GBAddress>"
' Returns "<GBAddress>Four score and seven years ago</GBAddress>"
' Returns "<GBAddress>Four score and seven years ago etc.</GBAddress>"
' Returns "<gbaddress>four score and seven years ago...</gbaddress>"
The Environment class has some very useful static properties and methods for retrieving information about the current environment and platform where your application is running. For example, the following code gets the current directory, machine name, operating system version, system directory, domain name, and user name from properties of the Environment class, and then displays them in a message box. You can also use the Environment class to retrieve a list of logical drives. The Environment class also contains methods that allow you to retrieve command line arguments and environment variables. For more information on the Environment class, see the .NET Help topic “Environment Class”. The DateTime structure is used to represent a date and time-of-day. DateTime has a number of static properties and methods you use to get date and time-related information. For example, the following code uses the DateTime structure to get the current date, current time, number of days in October 1960 (my birth month/year), and to determine if 2002 is a leap year. You can also instantiate an instance of the DateTime structure, passing a date and time that you want to work with in the constructor. The following code passes my birth date and time, October 9, 1960, 1:10 am (huge hint to readers who don’t want to miss an opportunity to send the author a birthday present) to the constructor of the DateTime structure. It then builds a string that contains the date, day, day-of-week, day-of-year, month, time-of-day, and year of my birthday. The second section of this code uses the DateTime structure’s AddYears method to return a new DateTime object that represents my 64th birthday (for you Beatle fans). The DateTime structure has many other methods you can use to add and subtract dates and times, as well as methods for converting to other data types. You can also check out the System.TimeSpan structure when working with time intervals rather than a specific date and time. The Math class performs common mathematical as well as logarithmic and trigonometric functions. The following code demonstrates using the Math class to round numbers (Round), determine the larger of two numbers (Max), the smaller (Min), and raise a number to a specified power (Pow). There are many other math functions you can perform using the Math class such as determining sign, cosine, logarithm, square root, and so on. 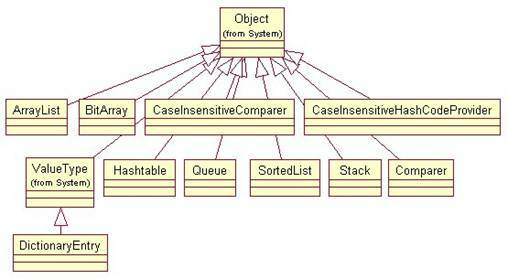 The System.Collections namespace contains classes that contain collections of objects. Figure 2 shows some of the classes that define collections of queues, arrays, hash tables, and dictionaries. Figure 2. The System.Collections namespace contains classes that contain collections of objects such as queues, arrays, hash tables, and dictionaries. The ArrayList class is an object-oriented array that can be dynamically resized at runtime. This is particularly useful in C# where an array’s dimensions cannot be changed. The ArrayList contains a variety of methods you use to manipulate array elements. To add elements to an ArrayList, you use the Add method, specifying the item to be added. You can also use the Insert method to insert an element at a specified index. You use the Remove method or the RemoveAt (specifying the index of the element to be removed) methods to remove elements from an ArrayList. You can access an element (get its value or set its value) at a specified index. You find the index of the first occurrence of a value by calling the IndexOf method. You find the index of the last occurrence of a value by calling the LastIndexOf method. The following code adds two duplicate values to an ArrayList, one at the beginning and one at the end, and then uses IndexOf and LastIndexOf to get their indexed location. The Capacity property specifies the number of elements an ArrayList can contain (the default value is 16). The Count property specifies the actual number of elements in the array. If the Count exceeds the Capacity, the Capacity is automatically doubled to accommodate the new array element. If you want to set the capacity to the actual number of elements, you use the TrimToSize method. For more information on the capabilities of the ArrayList class, see the .NET Help topic “ArrayList Class”. The Comparer class performs a case-sensitive comparison of two objects of the same type. The CaseInsensitiveComparer class performs a case-insensitive comparison of two objects of the same type. Each class has a Compare method you call and pass the two objects to be compared. It returns a –1 if the first value is less than the second value, a zero if the two objects are equal, and a 1 if the first value is greater than the second value. The following example shows the comparison of the same two strings using each class. The Comparer class returns a minus 1 indicating that “new york” is less than “New York”. The CaseInsensitiveComparer class returns a zero indicating that “new york” is the same as “New York”. So far, the collections you have examined only allow you to store the equivalent of a single array column. This can be somewhat limiting when you have multiple elements of the same value you want to distinguish in a unique way. This is where the HashTable class comes to the rescue. The HashTable class allows you to create a collection of key-and-value pairs organized based on the hash of the key. The following example creates a HashTable and adds three key-value pairs to it. Afterwards, it retrieves the value “Oranges” using the key “A2”. Notice when the string value is retrieved from the HashTable in the last line of code, it must be cast to a string. Why is this necessary since it was added to the HashTable as a string? Because each key-value pair comprises a single element of a HashTable and the element is of the type DictionaryEntry. The Queue class provides a first-in, first-out collection of objects. For example, you can use this class to process messages in the order they were received. The following code adds messages to the Queue class using the Enqueue method and retrieves and removes objects in first-in, first-out order using the Dequeue method. Figure 3 shows the resulting message box displayed by this code. Figure 3. The Queue class is a first-in, first-out collection of objects. 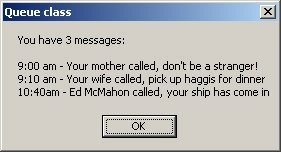 You can, for example, use it to process messages in the order they were received. The Stack and SortedList classes represent two additional types of collections. The Stack class is similar to the Queue class, except it is a last-in, first-out collection. You add items to the Stack class by using the Push method. You retrieve and remove items from the Stack class by using the Pop method. The SortedList class is a cross between a HashTable and an Array. You access an item in a SortedList using its key, as you do in HashTables. You can also access an item by passing its index to the GetByIndex and SetByIndex methods, as you do in an Array. If you’re building n-tier, distributed .NET applications, you’ll definitely use some of the classes found in the System.EnterpriseServices namespace. These classes provide access to COM+ services, including queued components, COM+ events, transaction services, and something you can’t get with either Visual FoxPro or Visual Basic 6—object pooling. COM+ services is still the primary Microsoft technology for hosting components, both COM and .NET, and the .NET Framework fully supports COM+. For more information on COM+, see the Hentzenwerke book “What’s New in Visual FoxPro 7” (chapter 14, “Playing in the COM+ Sandbox”). 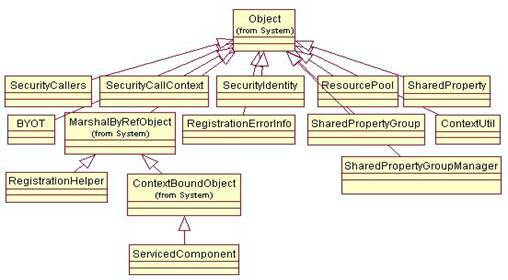 The main classes in the System.EnterpriseServices namespace are show in Figure 4. Figure 4. The classes in the System.EnterpriseServices namespace provide COM+ services access to your .NET components. · Configuring an assembly to use COM+ services – Before an assembly can use COM+ services, you need to set some special attributes on the assembly. · Deploying the assembly – You must install the assembly in the Global Assembly Cache (GAC). · Configuring a class to use object pooling – You must specify special attributes for each class that you want to pool. The following sections explain each of these steps in detail. To configure an assembly to use COM+ services requires that you set four assembly attributes: ApplicationActivation, ApplicationID, ApplicationName, and Description. These attributes are set in your solution’s AssemblyInfo.cs file (C#) or AssemblyInfo.vb file (VB .NET). First of all, notice that you need to add a reference to the System.EnterpriseServices namespace to your AssemblyInfo file as shown in the first line of the sample code. However, before you can do this, you must first add a reference to the System.EnterpriseServices .NET component in the Solution Explorer (this DLL is not automatically added to a project by VS .NET). To add this reference, right-click on your project’s References node in the Solution Explorer, and select Add Reference… from the shortcut menu. In the Add Reference dialog, select “System.EnterpriseServices” from the list of components on the .NET tab, click the Select and the OK button. The ApplicationActivation attribute needs to be set to either Library or Server (using the ActivationOption enumeration) depending on the type of COM+ application you are creating. The ApplicationName and Description attributes can be set to whatever descriptive text you want to give them. The ApplicationID attribute must be set to globally unique identifier (GUID). You can generate your own GUID by using the GuidGen.exe tool that comes with Visual Studio .NET (located in the Common7\Tools folder). 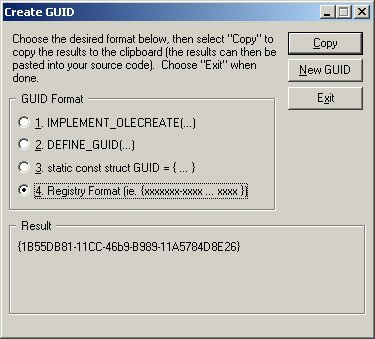 Just run GuidGen.exe and in the Create Guid dialog (Figure 5), select 4. Registry Format. Click the Copy button, to copy the new GUID to the clipboard, and then paste this new value into your AssemblyInfo file. You need to remove the curly braces that bracket the GUID. Figure 5. The GuidGen.exe tool allows you to generate globally unique identifiers (GUIDs) that you can use to create unique application IDs for your assemblies. · If your assembly is going to be used by non .NET clients, you need to register the assembly with COM+ services using the RegSvcs.exe tool that comes with Visual Studio .NET. The first parameter is the name of your .NET component. The second parameter (optional) allows you to assign a name to your COM+ application. The third parameter (also optional) allows you to specify the name of the type library generated by RegSvcs. To indicate that you want an object to be pooled, there are three main steps you need to take. The first step is to derive your class from the .NET ServicedComponent class that belongs to the System.EnterpriseServices namespace. All classes that use COM+ services must be derived from this class. The second step is to specify an ObjectPool attribute for the class you want to pool. The following example specifies that object pooling is enabled, the minimum pool size is 1, the maximum pool size is 75, and the creation timeout is 45 seconds (if you don’t specify values for these parameters, they are set to the COM+ defaults—minimum pool size of 0, a maximum pool size of 1,048,576, and a creation timeout of 60 seconds). The third step is implementing the three methods inherited from the ServicedComponent class—CanBePooled, Activate, and Deactivate. Clients use the CanBePooled method to determine if an object can be pooled. The Activate method is called by COM+ whenever an object is taken from the pool and activated, so you can place initialization code in here. The Deactivate method is called by COM+ whenever an object is placed back on the pool, so you can place cleanup code in here. The System.IO namespace contains classes that allow you to read and write to files and data streams, as well as classes for working with directories and paths (Figure 6). Figure 6. They System.IO namespace contains classes that allow you to read and write files and data streams. For example, the following code retrieves and displays the current working directory, sets the current directory to “c:\” and displays it, and then restores the original directory. The DirectoryInfo class performs many of the same functions as the Directory class. The difference between them is the Directory class performs a security check when each method is called (to determine if sufficient permissions exist to execute the requested method), and the DirectoryInfo class does not. If you are going to reuse an object to check directories multiple times, you should consider using the DirectoryInfo class because you may not need to continually recheck security. The difference between FileInfo and File is the same as DirectoryInfo vs. Directory. The File class performs the security check and the FileInfo class does not. If you want to create a file and add text to it, the StreamWriter class is a great tool for the job. For example, when you use the File class’s CreateText method to create a new file, it returns an instance of a StreamWriter class you can use to add text to the file. In the following code, a new text file named text.txt is created using File.CreateText, which returns a StreamWriter object. This object is then used to write three new lines of text to the file. Afterwards, the StreamWriter’s Close method is called, which closes the StreamWriter and the associated text file. The StreamReader class is great for reading text from a file. In the following code, a text file is opened using File.OpenText, which returns a StreamReader object. You use the methods of the StreamReader to read the text from the file. In this case, the ReadToEnd method is used to read all of the text in the file into the FileText variable. You can use other methods in the StreamReader class to read just a portion of the text from a file. For example, the Read method reads the next character or set of characters from the stream, and the ReadLine method reads a line of characters from the stream. The following code takes a fully qualified path and file name, breaks it down into each of its parts, and displays it. "c:\Program Files\Microsoft Visual Studio .NET\readme.htm"
The output of this message box is shown in Figure 7. Figure 7. The Path class allows you to extract the directory, extension, file name, and stem from a path string. Many applications have a need to perform a particular action when something changes in the file system. Often, this takes the form of waiting for a particular file to appear in a specified directory. The FileSystemWatcher class is a great class for this and other scenarios. Not only can you watch the file system of a local computer, you can also watch files on a network drive or a remote computer. You set the Filter property of the FileSystemWatcher class to the name of the file you want to watch. If you set the Filter property to an empty string, it watches for all files. You set the Filter to watch for a specific type of file by specifying an asterisk and a file extension, for example “*.xml”. The FileSystemWatcher class can watch for a variety of changes, including the attributes of a file or folder, the name of a file or directory, the last date/time a file or folder was written to, the size of a file or folder, and so on (Figure 8). Figure 8. The FileSystemWatcher class can watch for a variety of changes including changes in attributes, the last write date and time, the size of a file or directory, and the name of a file. The events you can watch for are change, create, delete, and rename. In order to respond to these events, you must add event handlers to the FileSystemWatcher’s Changed, Created, Deleted, and Renamed events. For example, in the following code, the WatchForFile method configures a FileSystemWatcher to watch for any .xml files created in the c:\ directory. It adds an event handler named OnCreated to the FileSystemWatcher’s Created event. Also notice the watcher’s EnableRaisingEvents property must be set to true before it begins watching. You can implement the FileSystemWatcher class in a wide variety of places. For example, you can creat a console application that sits on a server, waiting for XML files to be copied into a specific directory. These XML files might contain data that needs to be imported into your system. When an XML file is copied into the directory, the FileSystemWatcher object alerts the event handler, which imports the XML data, and then moves the file to a “processed” directory. The System.Net namespace contains a wide variety of classes to Web-enable your .NET applications (Figure 9). I can’t do justice to these classes in this short section, but I will go over a few of the main classes. Figure 9. The System.Net namespace contains classes that allow you to Web-enable your .NET applications. You can use the WebClient class to upload and download data from the Internet. The following example shows how to use the WebClient’s OpenRead method to open a file (in this case, the default web page on a web site) and read through the text with a stream reader. To upload data, you use the WebClient’s UploadFile method to upload a file or UploadData method to upload binary data. The following example uses UploadFile to upload a file named MyFile.xml. Note that you can only upload files using this method if you have permissions on the server. If you don’t have permissions, you will get a WebException error when you try to upload. The Dns class communicates with your default DNS server to provide some basic domain name functionality. In the following example, the Dns class’s Resolve method is called, passing a domain name, and an IPHostEntry object is returned. The IPHostEntry class acts as a container for host address information. As shown in the code below, you iterate through the IPHostEntry’s AddressList to get information on the addresses it contains. Dim IPList As String = ""
The System.Timers namespace contains only three classes—the main class is the Timer class, which functions similar to timers in Visual FoxPro. There is a Timer class in each of the System.Timers, System.Threading, and System.Windows.Forms namespaces, so you need to qualify the Timer class name with the namespace if you have referenced more than one of these in your code. The System.Timers Timer class is used to generate recurring events in your application. The System.Threading Timer class is used to call methods at specified intervals. The System.Windows.Forms Timer should be used in Windows Forms applications. See the .NET Help file for more information on each of these classes. In the following code, the StartTimer method sets the Interval of the timer to 2000ms (2 seconds), registers an event handler named OnElapsed with the timer’s Elapsed event, and then sets the timer’s Enabled property to true. After two seconds, the Elapsed event fires, calling the OnElapsed event handler which shuts off the timer by setting its Enabled property to false, and then displays a message to the user. This chapter really just scratches the surface of the .NET Framework’s namespaces and base classes. To learn more about each namespace and their associated classes, check out the .NET Help topic “.NET Framework Class Library in Visual Studio”, which covers different categories of namespaces.